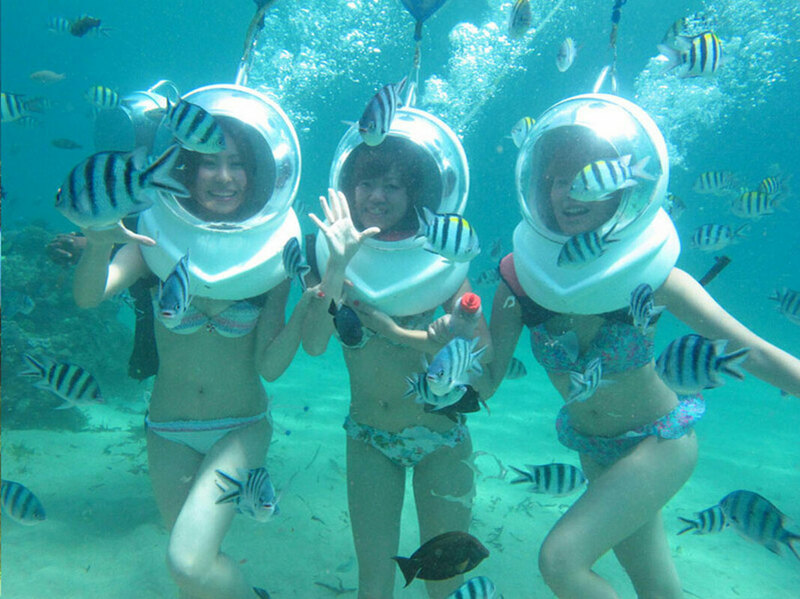 Bali Marine Walk using an open-ended helmet that allows the wearer to stay underwater by just putting it over head. The helmet is connected to the scuba thanks by air hose that supplies it with air. The interior of the helmet is designed with a defogging mechanism that prevents the front window from fogging. The helmet is also fitted with a vent which continuously exhausts unneeded air from the helmet. Since the bent is located at the back, there is no air valve to obstruct the guest's view. 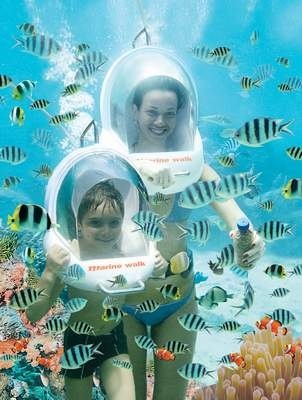 Guest wearing helmet descend a ladder to the ocean or aquarium floor where they can walk and experience the underwater world. Guest remain underwater for 20 - 30 minutes. The time was determined as the safest length of time for guests who have never been underwater before. Money for your drink in restaurang and for under the sea photo/video (on request) or if you want to use owned underwater camera, make sure it's designed for at least 8 meters depth. asthma or other respiratory ailments cannot dive. Guest with specific needs can also enjoy Bali Marine Walk as long as the can use both of their hands.